Between 2010 and Summer 2015, the Education Evaluation Center (EEC) identified 42 Western Oregon University (WOU) students as having a disability. 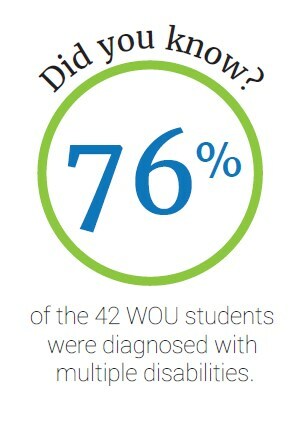 Many of those students were identiﬁed as having more than one disability/disorder. All were recommended to receive accommodations through the Western Oregon University Ofﬁce of Disability Services. This report explores the EEC's diagnoses, suggested accommodations, and impact.